It's time to really electrify your selfie game. 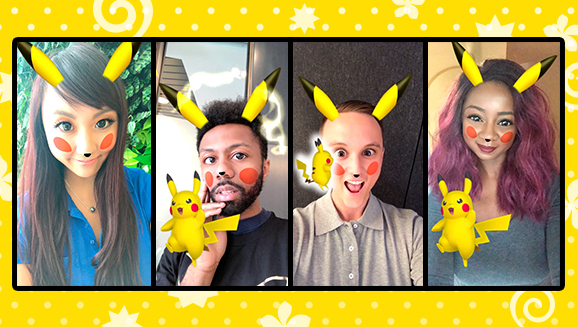 Now’s the time to electrify your selfie game, because a Pikachu Snapchat filter dropped today. Forgot the dog face, because for a limited time Snapchat users can slap Pikachu’s ears, nose, and bright-red cheek circles onto their own faces. The Pokémon Company announced via its blog Monday morning that for a limited time only, Snapchat would have this new Pikachu Lens. Other subtle facial tweaks also factor in, like magnified eyes and a rounding of the face. It’s totally shocking and absolutely electric. As an added bonus, opening your mouth with the Lens on makes a Pikachu appear. The little Pokémon strikes a pose, gives you a kiss, and then shouts at you before using Thundershock right on your face. Typical date night. The whole thing is actually a lot of fun, especially because it uses the authentic Pikachu voice and a recent character model. Mainly because it’s so awesome. To some, this is a #dreamcomechu. Usages vary from electrifyingly sweet to wildly energetic. Because let’s be real, that’s the definitive Pikachu in all our hearts. The official Pokémon News Blog promises that the Pikachu Lens will be around for a very short time, so be sure to snap all your selfies now while you still can.